Halfshafts (4K138) transmit engine torque from the rear axle housing to the rear wheels. Halfshafts rotate at approximately one-third the speed of a driveshaft and do not contribute to rotational vibration disturbances. A constant velocity (CV) joint is a mechanism for transmitting uniform torque and rotary motion while operating through a range of angles. CV joints at both inboard (differential) and outboard (wheel) ends provide operating smoothness. 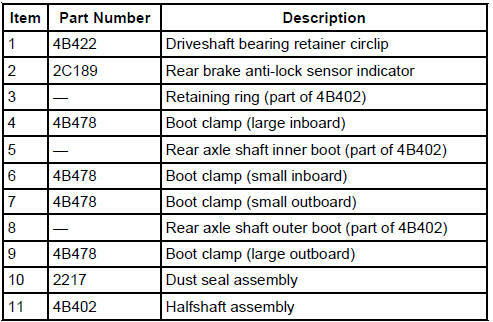 The inboard CV joints are plunge-type joints that provide the axial movement necessary to affect shaft length changes. The outboard CV joints have a higher angle capability than the inboard CV joints to accommodate suspension travel. Inboard and outboard CV joints connect to a splined shaft. A driveshaft bearing retainer circlip retains the splined inboard CV joint to the differential side gear. Install a new circlip every time you remove the halfshaft from the vehicle. A rear axle wheel hub retainer secures the interconnecting shaft and outboard CV joint to the rear hub. The lubed-for-life CV joints use special CV joint grease. They require no periodic lubrication. To separate the halfshaft from the rear hub, press the outboard CV joint from the rear hub. To separate the halfshaft from the differential, apply a load to the back face of the inboard CV joint assembly to overcome the circlip. The halfshaft assemblies are not repairable. Install a new assembly if worn/damaged. CAUTION: Never pick up or hold the halfshaft by the outboard joint. Handle all halfshaft components carefully during removal and installation. Do not over-angle the CV joints. Damage will occur to an assembled inboard CV joint if it is over-plunged outward from the joint housing. Never use a hammer to remove or install the halfshafts. Never use the halfshaft assembly as a lever to position other components. Always support the free end of the halfshaft. Do not allow the boots to contact sharp edges or hot exhaust components. Do not drop assembled halfshafts. The impact will cut the boots from the inside without evidence of external damage. Inspect all machined surfaces and splines for damage. WARNING: Do not balance the rear wheels and tires while mounted on the vehicle. Possible tire disintegration, differential or halfshaft failure can result, causing personal injury or extensive component damage. Use an off-vehicle wheel and tire balancer only. CAUTION: Use a frame-contact hoist only. Vehicle or component damage can result if other types of hoists are used. Never raise the vehicle using the halfshafts as lift points. During undercoating and rustproofing procedures, protect the boots from the coating materials. Foreign materials on the rubber boots will cause extreme advanced wear.